Although the Heinkel He 111 was designed ostensibly as a civil airliner for Lufthansa, its military potential was of a far greater importance. The first prototype of Siegfried and Walter Günter's enlarged, twin-engine development of the remarkable He 70 was fitted with a glazed nose when flown at Rostock-Marienehe on 24 February 1935, in the hands of Flugkapitän Gerhard Nitschke. An all-metal cantilever low-wing monoplane, it was powered by two 660-hp (492-kW) BMW VI 6,0Z engines and was followed by two further prototypes, each with shorter-span wings than those fitted on the first prototype. The third aircraft became the true bomber prototype and the second, which flew on 12 March 1935, was a civil version with a mail compartment in the nose and two passenger cabins, with seats for four and six passengers. After tests at Staaken this prototype eventually joined the Lufthansa fleet, although much of the development work on the civil version was carried out by the fourth prototype, the first to be revealed to the public and demonstrated at Berlin's Tempelhof Airport on 10 January 1936. Lufthansa received six He 111C 10-seat airliners during 1936, and these first entered service on the Berlin - Hannover- Amsterdam, Berlin-Nuremberg-Munich and Berlin-Dortmund- Cologne routes. Lufthansa received subsequently a number of He 111G-3 transports with 880hp (656-kW) BMW 132Dc engines and, later, a further generally similar batch under the alternative designation He 111L. Development of the military counterpart continued with the manufacture of 10 He 111A-D pre-production aircraft, based on the third prototype, but with a longer nose and armed by three MG 15 machine-guns in nose, dorsal and ventral positions. Two were used for operational trials at Rechlin but poor handling, power deficiencies and inadequate performance resulted in rejection, and all 10 were later sold to China. The solution was the installation of two 1,000-hp (746-kW) Daimler-Benz DB 600A engines, first fitted to the fifth (B-series) prototype which flew in early 1936 as the forerunner of the first production versions built at Marienehe from the autumn of 1936. These comprised the He 111B-1 powered by the 880-hp (656-kW) DB600, followed by the He 111B-2 with 950-hp (708-kW) DB 600CG engines. The improvement in the performance of these aircraft resulted in the Reichsluftfahrtministerium placing such large orders that it was necessary to build a new He 111 construction facility at Oranienburg, near Berlin, this being completed in 1937. The B-series was followed by the He 111D-1 with improved DB 600Ga engines, but the urgent need to divert DB 600 powerplant for fighter production meant that this version was built in only small numbers. This brought introduction of the 1,000-hp (746-kW) Junkers Jumo 211A-1, installed initially in an He 111D-D airframe to serve as the prototype of the He 111E-D pre-production series. In the initial production He 111E-1 bomber of February 1938 the bombload was increased to 3,7481b (1700 kg), but the He 111E-3 had another increase to 4,409 Ib (2000 kg), and the ensuing He 111E-4 could carry 2,205 lb (1000 kg) of this total on underfuselage racks; final sub-variant of the E-series, the He 111E-5 introduced an additional 183.7 Imp gal (835 litres) of auxiliary fuel carried within the fuselage. The next version into production was the He 111G which first introduced a new wing of simplified construction with straight, instead of curved taper. This was used first in the He 111G-3 civil transport built for Lufthansa, and there was some delay before it was approved by the RLM. Then followed the He 111G-1, basically similar to C-series aircraft but for the addition of the new wing, and the He 111G-4 which was powered by the 900-hp (671-kW) DB 600G engine; four He 111G-5 aircraft supplied to Turkey had Daimler-Benz 600Ga engines. Next came, unsequentially, the similar He 111F-1 powered by Jumo 211A-3 engines of which 24 were supplied to Turkey, and 40 virtually identical aircraft were built for the Luftwaffe in 1938 under the designation He 111F-4. Developed in parallel were the H-series and P-series, the latter introducing in 1939 a major fuselage redesign which replaced the stepped cockpit by an extensively-glazed cockpit and nose section and, at the same time, moved the nose gun position to starboard to improve the pilot's view. The pre-production He 111P-0 also introduced a revised ventral gondola, with the gunner in a prone position, and was powered by two 1,150-hp (858-kW) DB 601 Aa engines. Relatively few He 111Ps were built before this version was superseded by the H-series, the He 111P-1 which was virtually identical to the pre-production aircraft being delivered first in the autumn of 1939; the He 111P-2 differed only by having changes in radio equipment, and the He 111P-3 was a dual-control trainer. Heavier armour protection and up to six MG 15 machine-guns were introduced in the five-crew He 111P-4 which, in addition to carrying 2,205 Ib (1000 kg) of bombs internally had ETC 500 racks beneath the fuselage for a similar external load; the He 111P-6 had all-internal stowage for 4,409 Ib (2000 kg) of bombs, and later P-series conversions, for use as glider tugs with l,175-hp (876-kW) DB 60lN engines installed, were redesignated He 111P-2/R2. The major production version, built in a large number of variants, was the H-series, the He 111H-0 and He 111H-1 pre-production/production batches being basically the same as He 111P-2s except for the installation of 1,010-hp (753-kW) Jumo 211A engines. The He 111H-2 which became available in the autumn of 1939 had Jumo 211A-3 engines and carried two additional MG 15 machine-guns, one in the nose and one in the ventral gondola, and the He 111H-3 introduced armour protection and armament comprising a 20-mm MG FF cannon and an MG 15 in the ventral gondola, two MG 15s in the nose, one dorsally mounted, and similar weapons in beam positions. The He 111H-4 introduced Jumo 211D-1 engines and was equipped with two external racks to carry a 3,968-lb (1800 kg) bombload that could include two 1,686-lb (765-kg) differed only by having increased fuel capacity. When He 111H-3 and He 111H-5 aircraft were later fitted with a nose-mounted device to fend off balloon cables they were both redesignated He 111H-8, and subsequent re-conversion for use as glider tugs was made under the designation He 111H-8/R2. Junkers Jumo 211F-1 engines with variable-pitch propellers, and a fixed MG 17 machine-gun mounted in the tail, identified the He 111H-6; and the He 111H-10 was developed and built in small numbers especially for the night bombing offensive against the UK, these being equipped with Kute-Nase balloon cable-cutters in the wing leading edges and additional armour protection. Armament changes and a fully-enclosed dorsal position accommodating an MG 131 machine-gun identified the He 111H-11, in which the nose position carried a 20-mm MG FF cannon and the ventral MG 15 was replaced by a twin-barrel MG 81Z; when the beam guns were later replaced by MG 81Zs these aircraft were redesignated He 111H-11/R1, and changed their designation yet again to become He 111H-11/R2 when adapted to tow Gotha Go 242 gliders. The He 111H-12 and He 111H-15 were both built in small numbers, without the ventral gondola, to serve as missile launchers for Henschel and Blohm und Voss weapons respectively. The first of the pathfinder versions had the designation He 111H-14, and when converted later to serve as a glider tug was redesignated He 111H-14/R2. Built in large numbers, following introduction in the autumn of 1942, the He 111H-16 was generally similar to the He 111H-11, but equipped to carry a bombload of up to 7,1651b (3250 kg), although this necessitated the use of R-Geräte rocket-assisted take-off equipment; it was built in sub-variants that included the He 111H16/R1 which had a revolving dorsal turret with an MG 131 machine-gun, He 111H-16/R2 equipped for rigidbar towing of gliders, and the He 111H-16/R3 which carried additional radio equipment for use as a pathfinder. The ensuing He 111H-18 was also a pathfinder, with exhaust flame dampers to make it suitable for night operations, followed by the He 111H-20 built in sub-variants that included the He 111H-20/R1 carrying 16 paratroops, He 111H-20/R2 night bomber/glider tug, He 111H-20/R3 night bomber with heavier armour protection and improved radio, and the virtually identical He 111H-20/R4 with GM-1 power boosting equipment for the powerplant; when a 1,750-hp (1305kW) Jumo 213E-1 engine with two-stage superchargers was installed in He 111H-20/R3 aircraft they were redesignated He 111H-21. The He 111H-22 was equipped to carry a Fieseler Fi 103 (V-1) missile beneath each wing, and the final H-series variant was the He 111H-23 paratroop transport with 1,776-hp (1324-kW) Jumo 213A-1 engines. Produced in parallel with the F-series, the He 111J-0 and He 111J-1 were intended as torpedo-bombers and powered by 950-hp (708-kW) DB 600CG engines, but the He 111J-1 production aircraft, of which about 8 were built, were equipped as bombers. A single prototype was built of a proposed high-altitude bomber under the designation He 111R, powered by two 1,810hp (1350-kW) DB 603U engines, but no production aircraft resulted. Final, and certainly the most unusual version, was the He 111Z (Zwilling, or twin), designed to tow the Messerschmitt Me 321 Gigant transport glider. It comprised two 111H-6 airframes joined by a new wing centre-section which mounted a fifth Jumo 211F-2 engine. Two prototypes and 10 He 111Z-1 production aircraft were built during the winter of 1941-2. First deliveries to an operational squadron were made late in 1936, to l./KG 154 at Fassberg, and in February 193730 He 111B-1s were sent to the Legion Condor bomber unit K/88 in Spain, following operational trials in which four of the pre-production He 111B-0s were flown by a flight of VB 88. The He 111 bore the brunt of the Luftwaffe's bombing effort in early World War II: Poland in the autumn of 1939, Norway and Denmark in April 1940, France and the Low Countries in May and against British targets during the Battle of Britain. 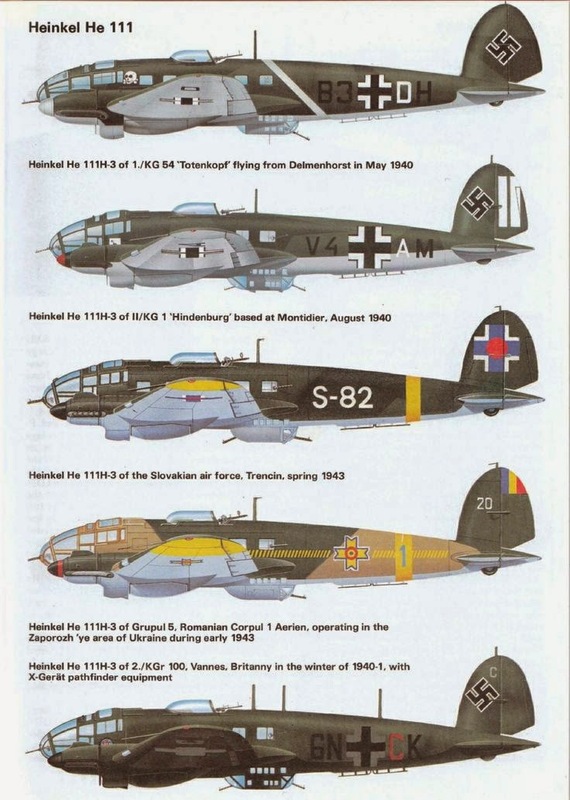 Large-scale introduction of the Junkers Ju 88, and the He 111's vulnerability to British fighters, resulted in the Heinkel bomber being transferred to night operations and to a variety of specialised roles, as a missile-carrier, torpedo-bomber, pathfinder and glidertug. Transport duties were also undertaken, including operations to supply the beleaguered German army at Stalingrad between November 1942 and February 1943, and by the end of the war He 111s were virtually flown only in the transport role. Production of more than 7,000 German-built aircraft for the Luftwaffe was completed in the autumn of 1944. In addition to those manufactured in Heinkel factories at Marienehe and Oranienburg, He 111s were built by Norddeutsche Dornierwerke in Wismar, by Allgemeine Transportgesellschaft in Leipzig, Arado in Babelsberg and Brandenburg/Havel and at other centres. Some 236 He 111Hs were built by CASA in Spain during and after the war as the CASA 2.111, approximately 130 with Jumo 211F-2 engines and the rest with Rolls Royce Merlin 500-29s; some were converted later for transport and training duties. He 111 A-0: 10 aircraft built based on He 111 V3, two used for trials at Rechlin, rejected by Luftwaffe, all 10 were sold to China". He 111 B-0: Pre-production aircraft, similar to He 111 A-0, but with DB600Aa engines. He 111 B-1: Production aircraft as B-0, but with DB600C engines. Defensive armament consisted of a flexible Ikaria turret in the nose A Stand, a B Stand with one DL 15 revolving gun-mount and a C Stand with one MG 15. He 111 B-2: As B-1, but with DB600GG engines, and extra radiators on either side of the engine nacelles under the wings. Later the DB 600Ga engines were added and the wing surface coolers withdrawn. He 111 B-3: Modified B-1 for training purposes. He 111 C-0: Six pre-production aircraft. He 111 D-0: Pre-production aircraft with DB600Ga engines. He 111 D-1: Production aircraft, only a few built. Notable for the installation of the FuG X, or FuG 10, designed to operate over longer ranges. Auxiliary equipment contained direction finding Peil G V and FuBI radio blind landing aids. He 111 E-0: Pre-production aircraft, similar to B-0, but with Jumo 211 A-1 engines. He 111 E-1: Production aircraft with Jumo 211 A-1 powerplants. Prototypes were powered by Jume 210G as which replaced the original DB 600s. He 111 E-2: Non production variant. No known variants built. Designed with Jumo 211 A-1s and A-3s. He 111 E-3: Production bomber. Same design as E-2, but upgraded to standard Jumo 211 A-3s. He 111 E-4: Half of 2,000 kg (4,410 lb) bomb load carried externally. He 111 E-5: Fitted with several internal auxiliary fuel tanks. He 111 F-0: Pre-production aircraft similar to E-5, but with a new wing of simpler construction with a straight rather than curved taper, and Jumo 211 A-1 engines. He 111 F-1: Production bomber, 24 were exported to Turkey. He 111 F-2: 20 were built. The F-2 was based on the F-1, differing only in installation of optimised wireless equipment. He 111 F-3: Planned reconnaissance version. Bomb release equipment replaced with RB cameras. It was to have Jumo 211 A-3 powerplants. He 111 F-4: A small number of staff communications aircraft were built under this designation. Equipment was similar to the G-5. He 111 F-5: The F-5 was not put into production. The already available on the P variant showed it to be superior. He 111 G-0: Pre-production transportation aircraft built, featured new wing introduced on F-0. He 111 G-3: Also known as V14, fitted with BMW 132Dc radial engines. He 111 G-4: Also known as V16, fitted with DB600G engines. He 111 G-5: Four aircraft with DB600Ga engines built for export to Turkey. He 111 J-0: Pre-production torpedo bomber similar to F-4, but with DB600CG engines. He 111 J-1: Production torpedo bomber, 90 built, but re-configured as a bomber. He 111 L: Alternative designation for the He 111 G-3 civil transport aircraft. He 111 P-0: Pre-production aircraft featured new straight wing, new glazed nose, DB601Aa engines, and a ventral gondola for gunner (rather than "dust-bin" on previous models). He 111 P-1: Production aircraft fitted with three MG 15s as defensive armament. He 111 P-2: Had FuG 10 radio in place of FuG IIIaU. Defensive armament increased to five MG 15s. He 111 P-3: Dual control trainer fitted with DB601 A-1 powerplants. He 111 P-4: Fitted with extra armour, three extra MG 15s, and provisions for two externally mounted bomber racks. Powerplants consisted of DB601 A-1s. The internal bomb bay was replaced with a 835 L fuel tank and a 120 L oil tank. He 111 P-5: The P-5 was a pilot trainer. Some 24 examples were built. The variant was powered by DB 601A engines. He 111 P-6: Some of the P-6s were powered by the DB 601N engines. The Messerschmitt Bf 109 received these engines, as they had greater priority. He 111 P-6/R2: Conversions later in war of surviving aircraft to glider tugs. He 111 P-7: Never built. He 111 P-8: Its existence and production is in doubt. He 111 P-9: It was intended for export to the Hungarian Air Force, by the project founder for lack of DB 601E engines. Only a small number were built, and were used in the Luftwaffe as towing aircraft. He 111 H-0: Pre-production aircraft similar to P-2 but with Jumo 211A-1 engines. He 111 H-1: Production aircraft. Fitted with FuG IIIaU and later FuG 10 radio communications. He 111 H-2: This version was fitted with improved armament. Two D Stands (waist guns) in the fuselage giving the variant some five MG 15 Machine guns. He 111 H-3: Similar to H-2, but with Jumo 211 A-3 engines. Like the H-2, five MG 15 machine guns were standard. One A Stand MG FF cannon could be installed in the nose and an MG 15 could be installed in the tail unit. He 111 H-4: Fitted with Jumo 211D engines, late in production changed to Jumo 211F engines, and two external bomb racks. Two PVC 1006L racks for carrying torpedoes could be added.". He 111 H-5: Similar to H-4, all bombs carried externally, internal bomb bay replaced by fuel tank. The variant was to be a longer range torpedo bomber. He 111 H-6: Torpedo bomber, could carry two LT F5b torpedoes externally, powered by Jumo 211F-1 engines, had six MG 15s and one MG FF cannon in forward gondola. He 111 H-7: Designed as a night bomber. Similar to H-6, tail MG 17 removed, ventral gondola removed, and armoured plate added. Fitted with Kuto-Nase barrage balloon cable-cutters. He 111 H-8: The H-8 was a rebuild of H-3 or H-5 aircraft, but with balloon cable-cutting fender. The H-8 was powered by Jumo 211D-1s. He 111 H-8/R2: Conversion of H-8 into glider tugs, balloon cable-cutting equipment removed. He 111 H-9: Based on H-6, but with Kuto-Nase balloon cable-cutters. He 111 H-10: Similar to H-6, but with 20 mm MG/FF cannon in ventral gondola, and fitted with Kuto-Nase balloon cable-cutters. Powered by Jumo 211 A-1s or D-1s. He 111 H-11: Had a fully-enclosed dorsal gun position and increased defensive armament and armour. The H-11 was fitted with Jumo 211 F-2s. He 111 H-11/R1: As H-11, but with two 7.92 mm (.312 in) MG 81Z twin-gun units at beam positions. He 111 H-11/R2: As H-11, but converted to a glider tug. He 111 H-12: Modified to carry Hs 293A missiles, fitted with FuG 203b Kehl transmitter, and ventral gondola deleted. He 111 H-14: Pathfinder, fitted with FuG FuMB 4 Samos and FuG 16 radio equipment. He 111 H-14/R1: Glider tug version. He 111 H-15: The H-15 was intended as a launch pad for the Blohm & Voss BV 246. He 111 H-16: Fitted with Jumo 211 F-2 engines and increased defensive armament of MG 131 machine guns, twin MG 81Zs, and a MG FF cannon. He 111 H-16/R1: As H-16, but with MG 131 in power-operated dorsal turret. He 111 H-16/R2: As H-16, but converted to a glider tug. He 111 H-16/R3: As H-16, modified as a pathfinder. He 111 H-18: Based on H-16/R3, was a pathfinder for night operations. He 111 H-20: Defensive armament similar to H-16, but some aircraft feature power-operated dorsal turrets. He 111 H-20/R1: Could carry 16 paratroopers, fitted with jump hatch. He 111 H-20/R2: Was a cargo carrier and glider tug. He 111 H-20/R3: Was a night bomber. He 111 H-20/R4: Could carry twenty 50 kg (110 lb) bombs. He 111 H-21: Based on the H-20/R3, but with Jumo 213 E-1 engines. He 111 H-22: Re-designated and modified H-6, H-16, and H-21's used to air launch V1 flying-bombs. He 111 H-23: Based on H-20/R1, but with Jumo 213 A-1 engines. He 111 R: High altitude bomber project. He 111 U: A spurious designation applied for propaganda purposes to the Heinkel He 119 high-speed reconnaissance bomber design which set an FAI record in November 1937. True identity only becomes clear to the Allies after World War II. He 111 Z-1: Two He 111 airframes coupled together by a fifth engine, used a glider tug for Messerschmitt Me 321. He 111 Z-2: Long-range bomber variant based on Z-1. He 111 Z-3: Long-range reconnaissance variant based on Z-1. The Spanish company CASA also produced a number of heavily modified He 111s under license for indigenous use. These models were designated CASA 2.111 and served until 1975. 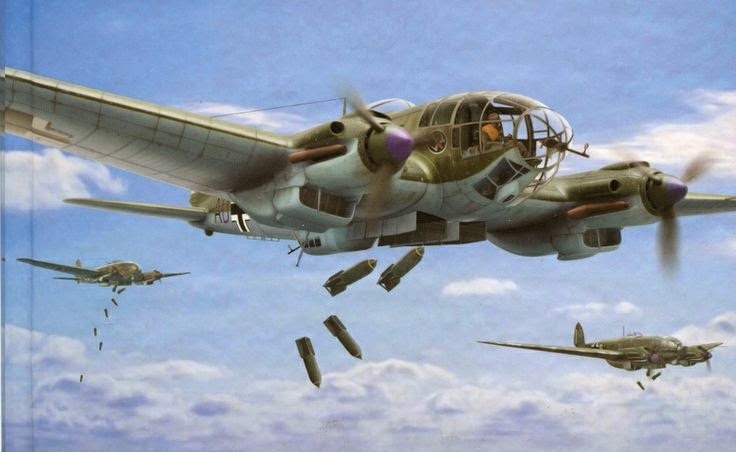 Following unsatisfactory tests of 10 pre-production He 111A-0 bombers, all were sold to China. Testing of the fifth prototype with 746 kW (1,000 hp) DB 600A engines led in 1936 to the production He 111B-1 with 656 kW (880 hp) DB 600C engines, followed by the He 111B-2 with the 708 kW (950 hp) DB 600CG. Six 10-passenger airliners for Lufthansa. An improved version with DB 600Ga engines and auxiliary wing radiators deleted; production was discontinued in favour of the He 111E. The shortage of DB 600 engines brought installation of 746 kW (1,000 hp) Junkers Jumo 211A-1 engines in an He 111D-0 airframe; the resulting He 111E-0 pre-production prototype had increased bombload; production He 111E-1 bombers were delivered in 1938, followed by the He 111E-3 and He 111E-4 with further increase in bombload and He 111E-5 with fuselage auxiliary fuel tank. The new wing of the He 111G and Jumo 211A-3 engines characterised the 24 He 111F-1 bombers supplied to Turkey; the Luftwaffe received 40 similar He 111F-4 aircraft in 1938. First version with the new straight-taper wing which, incorporated on the He 111C, brought redesignation He 111G-1; the He 111G-3 had 656-kW (880-hp) BMW 132Dc engines, the He 111G-4 671-kW (900-hp) DB 60OGs, and four He 111G-5 aircraft for Turkey had DB 600Ga engines. Developed in parallel with the He 111P series, the He 111H-0 and He 111H-1 were basically He 111P-2s with 753 kW (1,100 hp) Jumo 211A engines; the He 111H-2 of 1939 had improved armament; the He 111H-3 introduced armour protection and a 20-mm cannon; the He 111H-4 had Jumo 211 D-1 engines and two external racks for bombs or torpedoes, and the generally similar He 111H-5 had increased fuel capacity; the He 111H-6 introduced Jumo 211F-1 engines and machine-gun in the tailcone; He 111H-8 was the redesignation of He 111H-3s and He 111H-5s following installation of fenders for balloon cables, most of them being converted later to He 111H-8/R2 glider tugs; the He 111H-10 for night bombing of UK targets had additional armour, reduced armament and wing leading-edge balloon cable-cutters; the He 111H-11 and He 111H-11/R1 had revised armament, the last becoming He 111H-11/R2 when converted later as a glider tug; the He 111H-12 and He 111H-15 were missile-launchers, the He 111H-14 a pathfinder version and the He 111H-14/R2 a glider tug; introduced in 1942, the He 111H-16 was a major production variant similar to the He 111H-11 but able to carry a 7,165 lbs (3250 kg) bombload with the use of rocket-assisted-take-off gear. 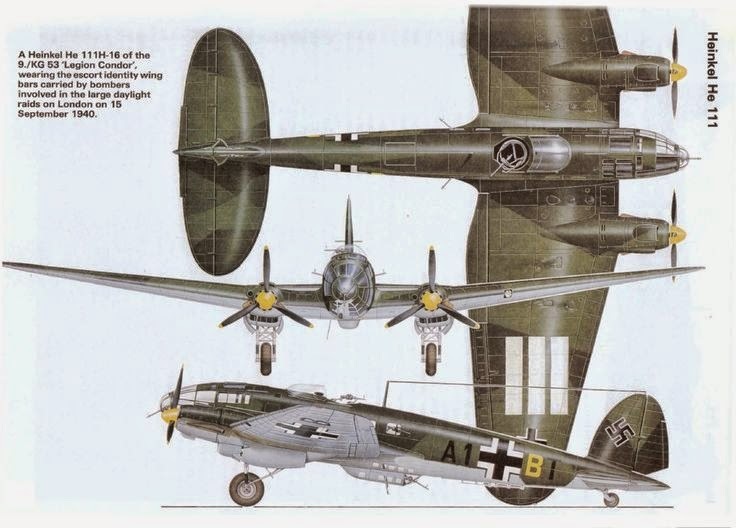 The He 111H-16/R1 had a revolving dorsal turret, the He 111H-16/R2 was for rigid bar towing of gliders and the He 111H-16/R3 was a pathfinder version as was the He 111H-18 with exhaust flame dampers. Four versions of the He 111H-20 comprised the He 111H-20/R1 capable of carrying 16 paratroops. The He 111H-20/R2 night bomber/glider tug, the He 111H-20/R3 with increased armour protection and the generally similar He 111H-20/R4 which introduced GM-1 power boost equipment. A version of the He 111H-20/R3 with 1,750 hp (1305 kW) Jumo 213E-1 engines and two-stage superchargers was designated He 111H-21. The He 111H-22 was a missile carrier and the He 111H-23 was a paratroop transport with 1,776 hp (1324 kW) engines. A torpedo bomber version of the He 111F series, the He 111J-0 and He 111J-1 both had 950 hp (708 kW) DB 600CG engines. The alternative designation for the He 111G-3 civil transport. In 1939 the He 111P series introduced a major fuselage redesign, the stepped cockpit being replaced by an asymmetric glazed cockpit and nose. The He 111P-0 introduced a prone position ventral gondola and was powered by two 1,150 hp (858 kW) DB 601Aa engines. First being deliveries of the He 111P-1 began in late 1939. The He 111P-2 was similar but for radio revisions. The He 111P-3 had dual controls and the five crew He 111P-4 had more armour and armament. The He 111P-6 had 1,175 hp (876 kW) DB 601N engines and its 4,409 lbs (2000 kg) bombload stowed vertically in the fuselage; when later converted as a glider tug the He 111P-6 became the He 111P-6/R2. The He 111Z (Zwilling, or twin) combined two He 111H-6 airframes, joined by a new wing centre-section to mount a fifth Jumo 211F-2 engine; designed to tow the Messerschmitt Me 321 Gigant transport glider; two prototypes and 10 He 111Z-1 production aircraft were built. Manufacturer: Ernst Heinkel AG, SNCASO (France), Fabrica de Avione SET, CASA (Spain), Romania. Powerplant: Two 1,350 hp (1007 kW) Junkers Jumo 211F-2 12-cylinder inverted Vee piston engines. Performance: Maximum speed 227 mph (365 km/h) at sea level; service ceiling 21,980 It (6700 m). Range: 1,212 miles (1950 km) with full bombload. Weight: (Z-2) Empty equipped 19,136 lbs (8680 kg) with a maximum take-off weight of 30,865 lbs (14000 kg). Dimensions: Span 74 ft 1 3/4 in (22.60 m); length 53 ft 9 1/2 in (16.40 m); height 13 ft 1 1/4 in (4.00 m); wing area 931.11 sq ft (86.50 sq m). Armament: One 20 mm MG FF cannon, one 13 mm (0.51 in) MG 131 machine gun and three 7.92 mm (0.31 in) MG 81Z machine guns, plus a normal internal bombload of 2,205 lbs (1000 kg). Could carry up to 7,165 lbs (3250 kg) of bombs (most externally) with the use of rocket-assisted-takeoff-gear (RATOG). Variants: He 111A, He 111B/B-1/B-2, He 111C, He 111D, He 111E/E-0/E-1/E-3/E-4/E-5, He 111F/F-1/F-4, He 111G/G-1/G-3/G-4/G-5, He 111H/H-1 to H-6/H-8, He 111H-8/R2, He 111H-10, He 111H-11, He 111H-11/R1/R2, He 111H-12/H-15 (missile launchers, He 111H-14 (pathfinder), He 111H-14/R2 (glider tug), He 111H-16 (major production version), He 111H-16/R1/R2/R3, He 111H-18, He 111H-20/R1/R2/R3/R4, He 111H-21, He 111H-22, He 111H-23, He 111J/J-0/J-1, He 111L, He 111P/P-0/P-1/P-2/P-3/P-4/P-6, He 111P-6/R2, He 111R, He 111Z/Z-1 (Zwilling). History: First flight (He 111V-1 prototype) 24 February 1935, (pre-production He 111B-0) August 1936, (production He 111B-1) 30 October 1936 (first He 111E series) January 1938, (first production He 111P-1) December 1938, (He 111H-1) January/February 1939, final delivery (He 111H-23) October 1944, (Spanish C2111) late 1956. Operators: Germany (Luftwaffe, Lufthansa), China, Hungary, Romania, Spain, Turkey.